From our vantage point right now in the evenings, the Big Dipper asterism is upside down. Look above the three stars of the handle for Canes Venatici, the Hunting Dogs. 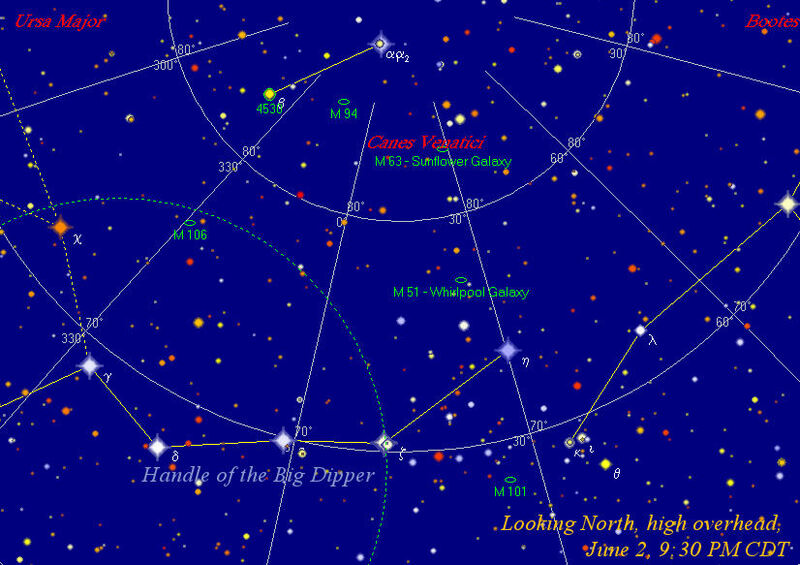 This week, you can catch several bright galaxies in this area high overhead in binoculars. These Messier galaxies, named for the first astronomer who cataloged them, Charles Messier (pronounced ME-see-ay,) are challenging, but attainable. Grab a chaise lounge chair, a pair of binoculars, lay back, and spend some time scanning this area. 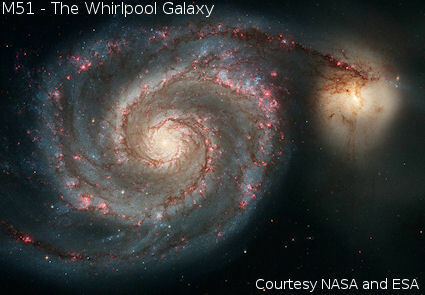 It’s easiest to hunt out M63, M94, and M106, but M51, the Whirlpool Galaxy, is the most famous of this group, and the most difficult to spot due to its low surface brightness. Consider yourself more than a beginning observer if you can bag this one. You can view a finder chart for these galaxies by clicking on the chart thumbnail image. Starting on Thursday evening, Mars is within 3° of Regulus in the constellation Leo. They're almost the same brightness, and make a striking color-contrast pair high in the west after dark. 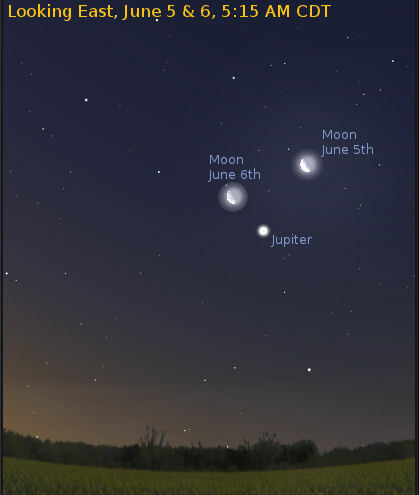 Follow them each evening until they reach conjunction on Sunday, June 6th, when they will be only 0.8° apart. On Friday evening, June 4th, the Moon reaches Last Quarter at 5:13 PM CDT. The Moon doesn’t rise Friday evening until 1:00 AM or so, which gives observers a few hours of dark sky observing before it comes up and washes the sky in moonglow. The bright Evening Star shining in the west-northwest during and after twilight is Venus. The twins of Gemini, Pollux and Castor, are above it. Venus is about as high in twilight as it will get this year in this part of the world. Venus is still a small gibbous disk in a telescope. It's so dazzlingly bright that you'll have the best telescopic views of it in the bright blue sky before sunset when the contrast is lower. After sunset, you may want to use a polarizing or neutral density filter to cut the glare. Later in the summer, Venus will be closer to Earth, and easier to view when larger and in its crescent phase. Also this week, the faint comet C/2009 R1 (McNaught) is nearing its period of best visibility in mid-June at magnitude 7.8. 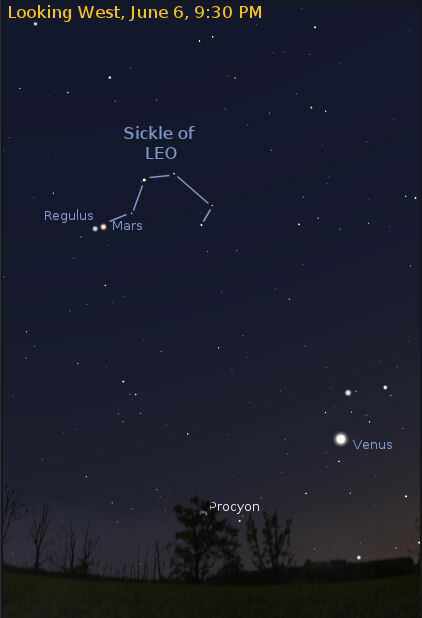 Look for it low in the northeast just before the start of dawn with binoculars or a small telescope. If you’re up to it, Saturday and Sunday morning just before dawn is a good time to catch the Moon and Jupiter rising together in the eastern sky. Just below the Circlet of Pisces, Jupiter climbs higher each week in the east-southeast during the early dawn hours. Don’t forget to try looking for Jupiter's Great Red Spot while the South Equatorial Belt is nearly invisible. Mercury can also be found very low in the east at dawn. Look for it with binoculars, below Jupiter and to the lower left. Saturn glows high in the southwest during the evening this week. In a telescope, Saturn's rings are tilted a mere 1.7° from edge-on, their minimum tilt for the next 15 years. Look for the thin black shadow-line cast by the rings across Saturn's bright globe. The ISS (International Space Station) will make several overhead passes during the early morning hours this week. The brightest of these will occur on Sunday and Tuesday mornings, both near magnitude -3.5. On Sunday morning, look for the ISS to rise in the SW at 5:31 AM, and pass overhead at a maximum altitude of 83° at 5:33 AM in the SE before setting in the NE at 5:36 AM. A bit earlier on Tuesday morning, the ISS will rise at 4:44 AM in the SW, reach a maximum altitude of 82° in the SE at 4:45 AM, and then set in the NE at 4:48 AM. The ISS will also make passes on Saturday and Monday mornings but will only reach a maximum brightness of magnitude -1.3 on these passes. There will also be several bright Iridium Flares this week in the early morning hours, with several reaching fairly bright magnitudes. But if you’re out and about in the evening on Thursday, June 3rd, try to catch Iridium 18 at an altitude of 63° in the eastern sky at 9:06 PM. Check the Heavens Above website for times and positions of Iridium Flares, the ISS, and other satellites in the nighttime sky. 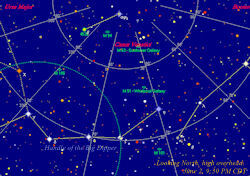 You can also view a current finder chart for comet C/2009 R1 (McNaught) on the Heavens Above website. After an unusually long solar minimum, activity on the Sun is picking up, with sunspots and other magnetic phenomena frequency increasing. Solar activity should continue to increase until the next solar maximum, which is expected in 2013. 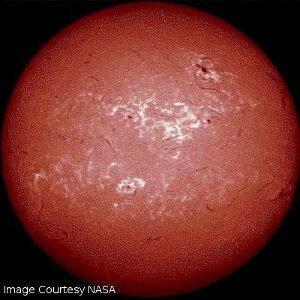 Solar images taken in red hydrogen-alpha light reveal much more information than the while-light images you might see through a normal solar filter. Hydrogen-alpha (Hα) light is a specific red wavelength of light produced by the emissions of the hydrogen fusion process in stars. Astronomers use a special filter that allows only light of this wavelength to pass through and be recorded either on film or by digital sensors. You might want to learn more about the Sun at the Solar and Heliopsheric Observatory (SOHO) site. Caution - Never look directly at the Sun! Always understand and use the proper filters and equipment before attempting to view sunspots or other solar phenomena. Vega, in the constellation Lyra the Lyre, now shines brightly in the east-northeast after dark. Vega is the first star of the Summer Triangle asterism to appear above the horizon each night starting in the Spring. 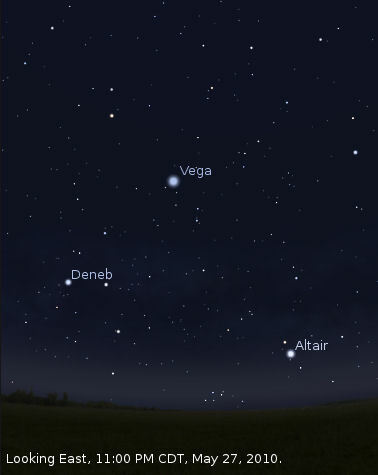 Deneb, the second of the three apices of the Summer Triangle, can be found about two or three fist-widths to Vega's lower left. Deneb is in the constellation Cygnus, the Swan. Being the third star of the Summer Triangle, in the constellation Aquila, the Eagle, Altair rises late in the evening significantly farther to Vega's lower right. 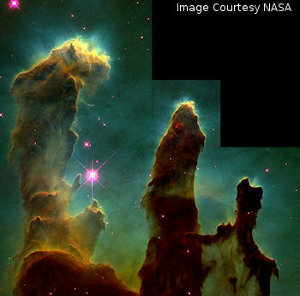 Aquila is the home of the Eagle Nebula (M16), the site of the “Pillars of Creation” image, made famous by the Hubble Space Telescope. The Full Moon occurs at 6:07 PM CDT,on Thursday, May 27th. Look for ruddy Antares just 1° or 2° to the Moon's lower right, as well as other surrounding stars of the constellation Scorpius. The Moon's glare will be bright; binoculars will give the best view. During the course of the evening, watch the Moon move with respect to these background stars. Venus is less than 3/4° from the 3rd-magnitude star Mebsuta (Epsilon Geminorum) Thursday and Friday evening. Look carefully, because Venus is 600 times brighter than Mebsuta. These comparison photos of Jupiter taken by amateur astronomer Anthony Wesley and posted by The Planetary Society show the planet's lost Southern Equatorial Belt on May 9, 2010. Ceres, the largest asteroid and first to be discovered, is passing close by the Lagoon Nebula (M8), in Sagittarius this week. Ceres is magnitude 7.5, well within binocular range. The Lagoon reaches a good observing altitude in the south-southeast by about 1:00 AM. Ceres will be closest to the Lagoon on the night of June 1st. Comet C/2009 R1 (McNaught) is nearing its period of best visibility, low in the east-northeast just before the start of dawn. Since it is faint, you'll need to bring a telescope or (perhaps) binoculars to see it. Check out the finder chart at the Heavens Above web site. Jupiter is below the Circlet of Pisces, an asterism in the Pisces constellation, all this week. Jupiter shines in the east-southeast in the early morning hours of dawn, climbing higher each week. Jupiter has lost its South Equatorial Belt (SEB) in recent weeks, which is a very rare event. A lucky break, because the disappearing belt makes the Great Red Spot much easier to see in small telescopes. 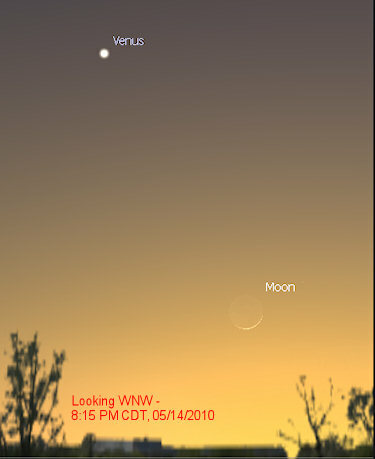 If the weather is clear, backyard astronomers will have an opportunity to catch a glimpse of a New Moon just a few hours old this Friday evening, May 14th. Find a place with a clear western horizon with no obstructions, and grab a pair of binoculars. Look to the west-northwest right after sunset (from about 8:00 PM to 8:30 PM) below Venus and you will see the very thinnest sliver of a waxing crescent Moon. Many intermediate and advanced amateur astronomers have competitions to see who can spot the youngest crescent Moon just after New Moon. This month, New Moon occurred at 8:05 PM CDT on Thursday, May 13th. If the weather is clear, The International Space Station (ISS) is also visible several times this week. The ISS makes magnitude -2.2 and brighter passes overhead every evening Friday through Monday. The table at the bottom of this article shows the times, altitudes, magnitudes, and directions of these passes. You can check http://www.heavens-above.com for additional passes and times. You should also able to spot several bright Iridium Flares this week. On Friday, May 14th at 10:30 PM CDT, Iridium 40 passes to the ENE (azimuth 70°) at an altitude of 33°, with a magnitude of -4. Astronomers refer to azimuth (Abbr: Az.) and altitude (Abbr: Alt.) instead of direction and height, but you can easily remember that azimuth is the same as the bearing on a compass, so az. 0° is North, Az. 90° is East, Az. 180° is South, and Az. 270° is West. When astronomers refer to altitude, Alt. 0° is at the horizon and Alt. 90° at the zenith (the zenith is the highest spot in the sky at any point in time, that is, directly overhead.) So that means Alt. 45° is halfway up the sky from the horizon to the zenith. Saturday morning, May 15th at 4:08 AM CDT, Iridium 60 will pass to the ESE (Az. 111°,) at Alt. 17° above the horizon, but it will be bright, at magnitude -6. That same Saturday evening at 8:49 PM CDT, Iridium 54 passes high overhead in the E (Az. 97°) at Alt. 66°. Iridium 54 will be almost as bright as Iridium 60 at magnitude -5. Monday morning, May 17th, at 4:05 AM CDT, Iridium 90 passes low in the ESE (Az. 114°) at Alt. 19°, magnitude -4. Then on Tuesday, May 18th, at 3:58 AM CDT, Iridium 59 makes a bright appearance low in the ESE (Az. 116°) at Alt. 16°, at a magnitude of -6. Several other dim Iridium Flares will occur during the week as well. Again, you can check the times and locations at http://www.heavens-above.com. 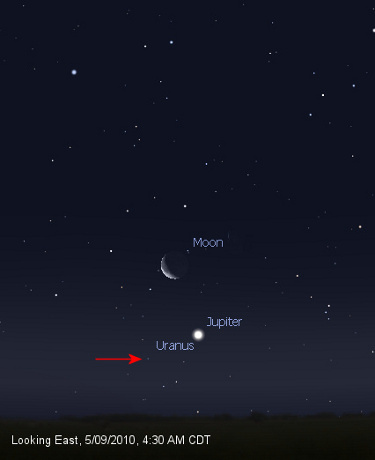 On the morning of May 16th, look for Jupiter and Uranus to rise together, within 3° of each other on the eastern horizon at 5:00 AM CDT. 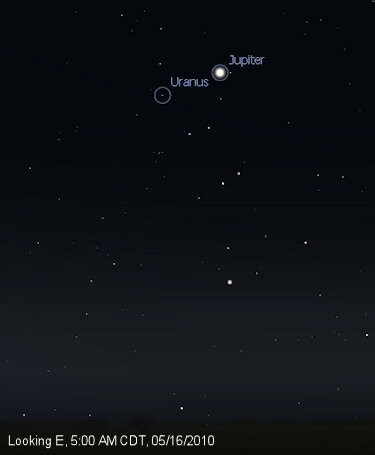 Uranus is hard to spot, and may only be visible in binoculars or a small telescope, depending on your location. They will continue to rise closer together until they get within 0.5° of each other in early June. 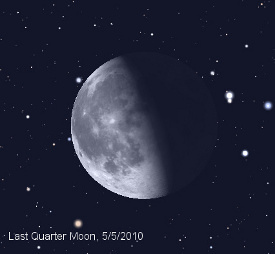 Wednesday night, the Last Quarter Moon will occur at 11:16 PM CDT. Do you know the names of the Moon? “Moon” is a Germanic word, related to the Latin word mensis, which means month. However, the Latin name for the Moon was Luna, from which we get lunar, and lunatic. In Greek mythology, the Moon was known as Selēnē. The modern term selenology is a derivative, and it refers to the study of lunar science, including geology. The Moon is the fifth largest natural satellite in the Solar System, which makes it unique because Earth, the Moon’s host planet, is only about 4 times as large as the Moon. The close Earth-Moon size relationship makes it almost a binary planet system rather than a planet-satellite system such as those found in the large outer planets. 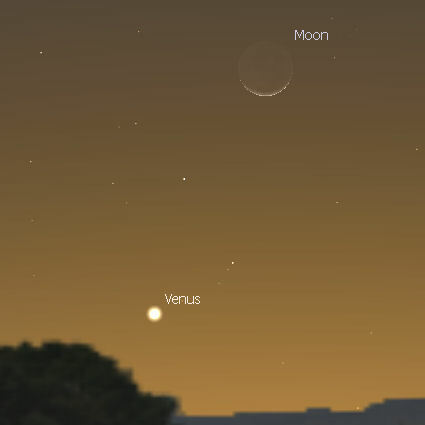 Earth’s sister planet Venus is low in the western sky in early evening, and will be setting by around 10:00 PM CDT. Venus may not be visible if your western horizon is blocked by trees or buildings. 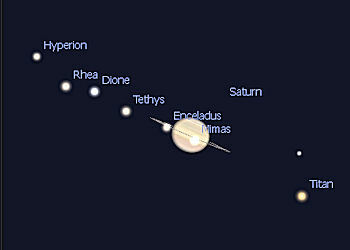 Yellowish Saturn is high in the southeastern sky in the evening, this week, and will be visible all night. Reddish Mars also rides high in the southern sky in the evening, and will be visible all night as well. The Earth is slowly drawing farther away from both these planets as the year progresses, so they will be slightly dimmer each night as the year wanes. The dimming of these two wanderers would not necessarily be visible from night to night but it is noticeable when compared from month to month. 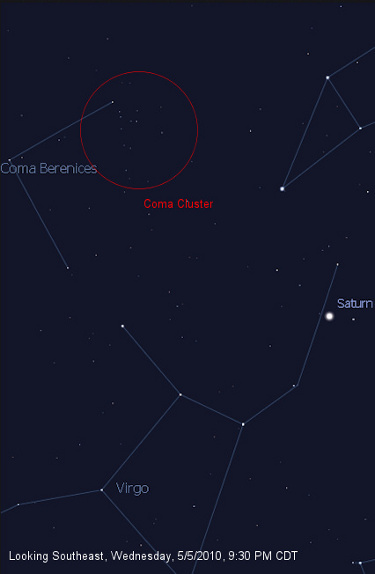 All this week, The Coma Cluster is visible above Virgo high in the southeastern sky. This is a beautiful open star cluster visible in 7X50 or 10x50 binoculars. Probably the best time for viewing this cluster is between 9:30 and 11:00 PM CDT on Thursday, Friday, or Saturday evenings. 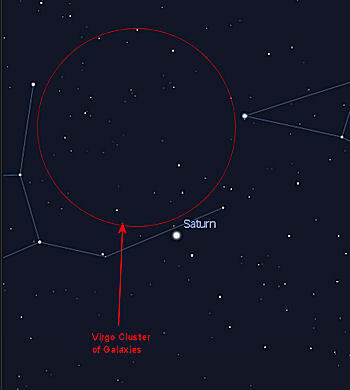 Don’t forget to look for galaxies in the Virgo Cluster this week as well. See last week’s post for details on that. According to most sources, the Eta Aquarid Meteor shower peaks on the morning of Thursday, May 6th. The best time for viewing will be between 3 and 5 AM CDT on the mornings of May 5th, 6th, and 7th. One of two meteor showers composed of dust particles from Halley’s Comet, every year the Eta Aquarids can be seen from as early as April 21 through about May 12. However, the number of meteors you are likely to see will be low until around the time of the peak on May 5/6. At their peak, Northern Hemisphere observers are likely to see about 10 meteors every hour. Unfortunately, since the waning crescent Moon is just past Last Quarter, the Moon will be in the south eastern sky in the early morning hours, and some of the fainter meteors may be rendered invisible due to resulting moonglow. Look low in the eastern sky in the early morning on Sunday, May 9th for Jupiter rising below the crescent Moon. 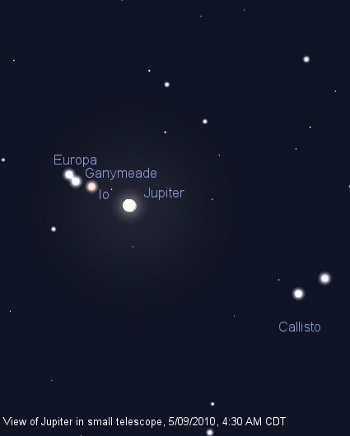 Also on Sunday morning, you can catch the Galilean Moons (the four largest moons of Jupiter,) in a small telescope or binoculars before dawn between 4:30 and 5:00 AM CDT. The International Space Station will make another pass low in the northern sky on Tuesday, May 11th. The ISS will rise in the North, becoming visible when it is 10° above the horizon, rise to 14° in the north-northeast, and then sink back to about 10° in the NNE before disappearing again. It will only reach about -0.7 magnitude this time. There will be several Iridium Flares this week, mostly in the early morning hours, however the brightest will be in the evening on Sunday evening, May 9th. Look for Iridium 83 Sunday evening at 9:16 PM CDT high in the Eastern sky at an altitude of 58°. This flare will reach a brightest magnitude of -8 so it should be an easy catch. Check the web site at Heavens Above for other Iridium Flare times and locations. The Moon is just past Full this evening, which occurred at 7:18 AM CDT. Tonight the Moon rises at 8:42 PM CDT, which washes out most of the eastern and southern skies. It is also too bright at or near Full to view through a telescope or binoculars, unless you have a filter. However, the Moon does look great when Full and viewed with the unaided eye. One thing you can catch even with a Full Moon will be the brightest pass of the International Space Station (ISS) this week at -3.3 magnitude (Mag.) The ISS passes overhead starting at 9:18 PM CDT. It will swing from an altitude of 10° in the SW, up to 82° in the NW, then sink to 11° in the NE before becoming invisible. Look for the ISS to reach its brightest high overhead in the northwest. 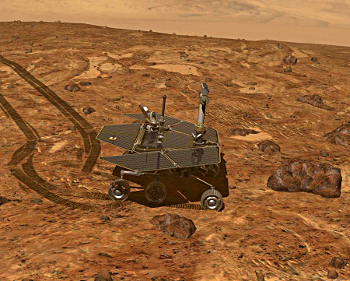 Mars is also high overhead, but now dimming in Cancer as it pulls away from the Earth. Mars is still east of the Beehive Cluster. Jupiter is rising just before dawn in the eastern sky. At this time of the morning, Jupiter is brightest object in the sky. 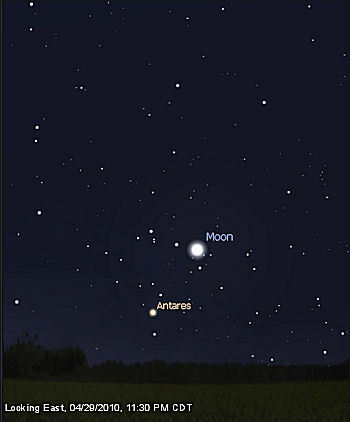 Look to the lower left of the Moon tonight after 11 PM or so for rising Antares. Antares (an-TAR-eez) is a bright red supergiant star in Scorpius, with an approximately 800 times larger radius than our Sun. But Antares is a cool, low density star, with only about 18 solar masses, and it radiates most of its energy in the infrared part of the spectrum. Antares resides about 600 light years from our Solar System. Catch the ISS again this evening at 8:44 PM CDT, starting at 10° in the S, going up to 24° in the SE, then back to 10° in ENE. It stays low in the sky this evening and shines a bit less bright at only -2.1 Mag. Many members of the Virgo Cluster of Galaxies can be spied in binoculars on a good dark, moonless night. This area in Virgo is home to a huge group of galaxies, which are part of our own Local Supercluster. Tonight you have a chance to see many of them before the Moon rises, just before 11:00 PM. Look for very faint fuzzy splotches slightly bigger than stars. Stars will always appear as a point source in binoculars or a telescope, but extended objects like galaxies and nebula will appear to be larger than points, sometimes much larger. In a medium amateur telescope (10” or so,) there are enough galaxies visible in this part of the sky to keep you busy most of the night. On Friday evening, the ISS passes low in the north but brighter than the last one at -3.1 Mag, starting at 8:34 PM CDT, look for it at 10° in the NNW. It will be hard to spot this time since it won't get more than 10° above the horizon. Venus is near the Pleiades low in the western sky all week. The Pleiades or M45, is a nearby region of recent star formation, and so is full of hot, young, blue-white stars. 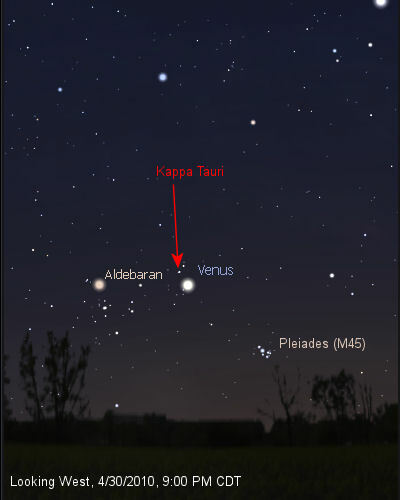 On Saturday evening, look ¼° to the lower left of Venus in binoculars for Kappa Tauri — a binary star in Taurus. You should be able to discern both components of the binary pair in binoculars. 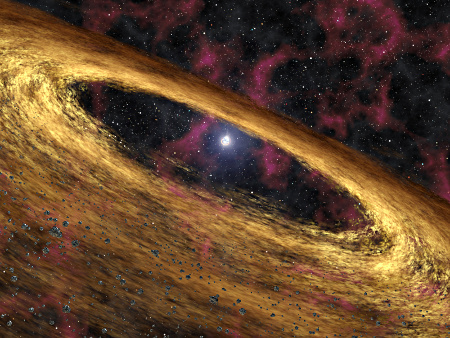 Whether you realize it or not, most star systems are binary stars. As a single star, our Sun is an exception, not the norm. You can catch Iridium Flares on Sunday, Monday, and Tuesday evenings. On Sunday morning, Iridium 96 flares to -7 Mag at 6:04 AM CDT, Look for it at an altitude of 27°, in the north-northeast. Saturn is high in the south at the head of Virgo all week. Look for fine black shadow of rings on disk of planet in telescope or binoculars. On Monday evening, Iridium 56 flares to -8 Mag at 9:43 PM CDT. It should be visible at an altitude of 49° in the eastern sky. Remember, Iridium Flares are brief and not something that will be visible for more than a few seconds. The flare Monday night will be the brightest one visible this week. On Tuesday, you have two chances to see an Iridium Flare. In the morning, Iridium 29 flares to -3 Mag at 5:47 AM CDT, 21° high in the north-northeast. In the evening, Iridium 84 flares to -2 Mag at 9:37 PM CDT, at an altitude of 49° in the eastern sky. This time of year, the Big Dipper rides high in the northeastern sky in the evenings, tilted back so the “water” runs out and appears to fill the bowl of the Little Dipper. The Big Dipper and Little Dipper are asterisms found in the constellations of Ursa Major, the Great Bear, and Ursa Minor, the Lesser Bear, respectively. An asterism is a highly recognizable pattern in the night sky that is not one of the 88 constellations designated by the International Astronomical Union (IAU). Although the pattern may wholly reside in a single constellation, often times it does not. 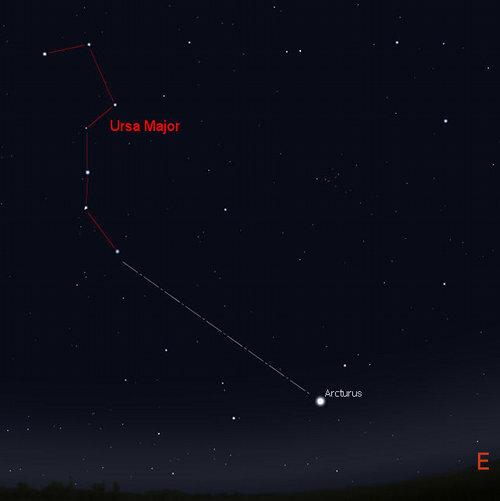 An asterism may even be what we recognize as a constellation, as is the case with the Big Dipper, which is what we normally think of when we look for the constellation Ursa Major. As mentioned in a previous column, the “pouring out” of the Big Dipper is typically associated with the coming of spring rains. Although the Lyrids are common throughout the month of April, this week is the best time to view this meteor shower. Astronomers expect this lesser-known shower to be active Thursday and Friday morning in the hour or so before dawn, just after the Moon sets. The Lyrids are typically weak, but are known for occasional outbursts and sometimes even large bolides (fireballs,) like the one that occurred in the northern sky on April 10th. The April 10th fireball was visible from Fort Smith and all over NW Arkansas. All of the meteors in this shower appear to come from somewhere in the constellation Lyra, which is home to the bright star Vega. Vega was popularized as the source of alien signals in the 1997 movie Contact, based on Carl Sagan’s book by the same name. The latter half of this week will also be a great time to observe the Moon, which passed First Quarter at 1:20 PM CDT on Wednesday April 21st. Using a small telescope or binoculars reveals a myriad of craters and other lunar features. Pay special attention to the terminator, which is the line of demarcation between the lit portion of the Moon and the dark side. Here, you will find the best contrast which in turn enables you to see the smallest details. 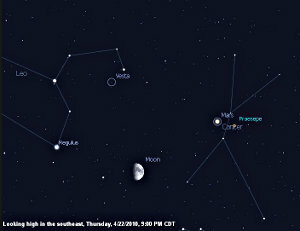 On Thursday evening, April 22nd, the Moon will be in a very nice tight grouping with Mars, the Beehive Cluster (also known as Praesepe or M44,) the bright asteroid Vesta, and Regulus. Regulus is the bright star at the end of the handle in the Sickle of Leo, another well-known asterism. 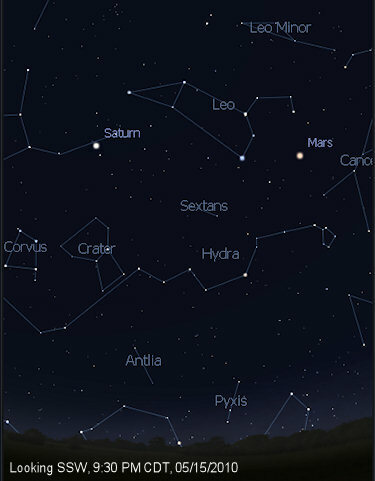 Look below the Moon on Thursday evening for the orange-red star Alphard, the heart of Hydra, the Water Snake. On Friday evening, April 23rd, Venus and the Pleiades (pronounced PLEE-a-deez, also known as the Seven Sisters or M45,) will be within the 5° of a single field of view in binoculars. Look for them low in the west just after sunset. The International Space Station (ISS) will pass overhead several times over the next few days, but the two brightest passes will be on Monday and Tuesday mornings at 5:33 AM and 5:57 AM, respectively. In both cases, the ISS will begin rising in the NW. On Monday, April 26th the ISS will reach maximum altitude of 67° in the NE, at a magnitude of -3.0. On Tuesday, April 27th, it will only reach 27° in the SW at a magnitude of -2.3. You can find out more detail about when the ISS will be overhead at http://www.heavens-above.com. This coming week is the last week of the Winter season in the northern hemisphere, and is marked by the appearance of fiery Arcturus (Ark-TUR-es) in the evening Eastern Sky. Arcturus (Alpha Boötis,) is by definition the brightest star in the constellation Boötes (pronounced Boh-OH-teez.) The Ancient Greek name Arcturus means “Guardian of the Bear,” and is appropo considering its proximity to Ursa Major and Ursa Minor, the Great and Small Bears. The orange giant star's celestial appearance was supposed to portend tempestuous weather in Ancient Greece, and that certainly seems true in our millennium as well! 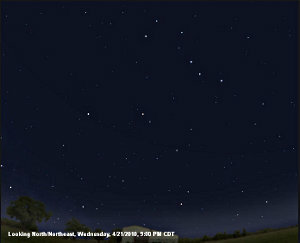 Looking northeast in the evenings this week, you will find the Big Dipper (part of Ursa Major) tipping back on its handle until the water spills out the back of the bowl, which is another ancient sign of stormy weather ahead. Following the handle from the bowl in an arc along the handle stars will lead you to Arcturus (see Figure 1.) Arcturus, being the third brightest star in the sky after Sirius and Canopus is a mere 36.7 light years from Earth. This places it in the same vicinity in the Orion Arm of the Milky Way galaxy as Earth — a very close neighbor in astronomical terms. Venus is very low in the southwest just after sunset this week, but will be rising higher and higher each evening. If you look carefully, you might just find the thinnest sliver of the New Moon below and to the right of Venus during the last of the sunset on Tuesday, March 16th. By Wednesday, the now-visible waxing crescent Moon will be higher than Venus in the west-southwest. Saturn is getting higher in the night sky this week and is nearing opposition, which falls on March 21 this year. Look for Saturn low in the east after sunset, higher in the southeast in late evening, and at its highest in the south at 1:00 AM this week. The rings are tilted nearly edge-on now, and will reach their most edge-on position in May. Mercury is hidden in the glare of the Sun. Jupiter is now rising as a morning star, but hidden deep in the surrounding glow of the Solar disk. Uranus and Neptune are also both hidden in the glare of the Sun. The Spring Equinox occurs at 12:32 PM Central Daylight Time on Saturday, March 20, and marks the beginning of Spring in the Northern Hemisphere. That evening, we will see a special treat. The Moon will be right next to the Pleiades (PLEE-a-deez) that evening, and will present a spectacular sight — especially in binoculars! 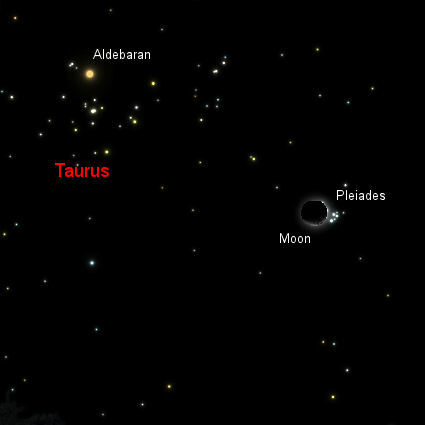 The Moon will be so close that it will occult some of the fainter outlying stars of the Pleiades cluster. An occultation is the covering of one celestial object by another as the first object passes in front of the second. 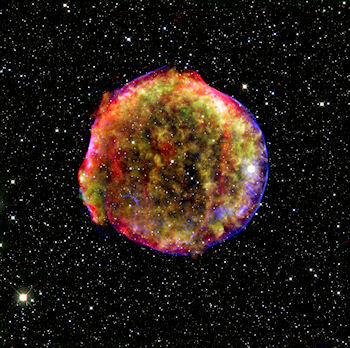 The best observing time for this is 9:00 or 9:30 PM on Saturday, March 20th. Be sure to mark your calendar! This event will be the last occultation of the Pleiades by the Moon visible from North America until 2023. The International Space Station will not be visible this week, but there will be a couple of bright Iridium Flares, if the weather cooperates. We have a shot at a VERY bright one (mag -8.0) at 6:23 AM on Sunday morning, March 14th, when Iridium 72 passes nearly directly overhead. Look directly North at an altitude of 46Â° to catch this flare. Another bright Iridium Flare will occur early on Friday evening at 7:53 PM. Iridium 25 will only reach magnitude -2.0, and will be visible in the south-southeast at an altitude of 49Â° above the horizon. You might also want to try to catch Iridium 62 at 6:17 AM on Monday, March 13th in the North at an altitude of 44Â°, or Iridium 22 at 7:59 PM on Thursday, March 18th in the SSE at an altitude of 47. These two flares will only reach magnitude -0.0 and -1.0, respectively.